The new Tamerica TW2100 2:1 Pitch Twin Loop Wire Binding Machine makes wire binding easier than ever. 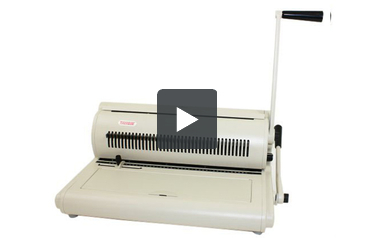 The TW2100 is one of the most stylish desktop wire binding machines on the market. It has a built in wire holder and a concealed easy to use wire closer near the front of the machine. The dual handle design helps to ensure that the wire closer stays accurate over time and reduces wear and tear on the punching dies. The fact that the TW2100 is capable of punching and closing legal sized twin loop wire makes it one of the best bargains in the industry. Open Ended for punching documents larger than 14". Binding Capacity: 3/16" - 1-1/4"
Welcome to MyBinding video. This is a look at the Tamerica TW2100, a 2:1 pitch twin loop wire binder. This all-in-one unit and its instruction booklet make it easy to bind a book. Let's watch it in action. First, set your side margin control knob so that all punches are consistent throughout your project. Remove any of the disengageable die pins that you might need for custom size sheets or areas you do not want punched. Once your holes are where you want them, let's begin with the covers. Slide the bind end into the machine and punch all the way down. Continue on through the rest of the sheets in your project, punching up to 20 sheets of 20lb paper per lift. When you're through with punching, gather your book in order, it's time to bind. Take your twin loop wire, slide it just into the lid here, and hold it into place. A little trick in wire binding is to take your back page, flip it over so it faces the front page and then thread the project. And this hides the seam in the end behind the back page. And thread your whole project over the teeth of the wire bind, remove it, it's time to close it. Lift the lid on the face of the machine and you can make your adjustments as to just how far the closer will close. Make your setting and with the other handle, close the bind. There it is, it's as simple as that with the Tamerica TW2100. For more demos, reviews, how tos on this product and many more, check out MyBinding.com. The Tamerica Tashin TW2100 is a twin loop wire binding machine that includes a 2:1 pitch punch, a wire hanger and a heavy duty wire closer. It is great for binding documents with double loop, twin loop, wire-o, double-o and Wirebind spines. The TW2100 offers a stylish and compact design which makes it an ideal choice for companies that don't have room for a large and obtrusive binding system. It is designed specifically for binding documents using 2:1 pitch wire-o spines. It can be used with standard two to one pitch wires for binding documents between 5/8" and 1-1/4" and is also compatible with specialty small sized 2:1 pitch wires. The TW2100 has 27 fully disengageable punching pins for handling sheets that are up to fourteen inches in length. This makes the TW-2100 the least expensive two to one pitch wire binding system capable of binding legal sized books. This machine has two handles. One handle operates the punch which can produce holes in up to 20 sheets of paper at a time. The second handle operates the wire closer. The fact that the TW-2100 has two handles helps to ensure that the wire closer stays accurate and true over time and it helps to reduce stress on the punching mechanism of the machine. The TW-2100 has fully disengageable dies. Using the pull pins that are located on the front of the machine it is possible to stop any single hole from punching along the edge of your book. This means that you can punch any length of document up to fourteen inches without having to worry about leaving half a hole on the edge of your documents. It also has a four position depth of punch control. Using a small knob on the side of the machine you can adjust the distance of the holes from the binding edge of your document. The TW-2100 is made of metal not of plastic. The metal components are heavy duty and are designed for durability in organizations that bind documents every day. Like other machines from Tamerica the TW-2100 comes with a two-year warranty. Most other wire binding machines come with a one-year warranty. The extra year offered on this machine give you added protection on your investment. The TW-2100 has a concealed wire closer on the front of this machine. The fact that you have to flip open the lid to the compartment in order to use the wire closer adds another step to the binding process. The design looks good but cuts into productivity. This machine has a manual punching mechanism. Although twenty sheets is a good punching capacity for a wire binding machine, the TW2100 is still a manual binding machine. It is ideal for light to moderate binding applications. Users who need to bind a lot of documents or thick documents may want to consider a machine with an electric punch. This machine produces a 2:1 pitch punching pattern. It is specifically designed for binding documents with wires that are from 5/8" up to 1-1/4" but can also be used with special small sized 2:1 pitch wires which are available but cost more than standard 3:1 pitch wires. The TW-2100 is an excellent 2:1 pitch double loop wire binding system that offers both punching and binding for books up to fourteen inches in length. It includes heavy duty metal construction, a convenient compact design and fully disengageable dies. All of these things make the TW2100 a great solution for small and medium sized offices that are looking for a reasonably priced wire binding solution. However, this machine is a manual binding system and thus does not lend itself to high volume punching applications.